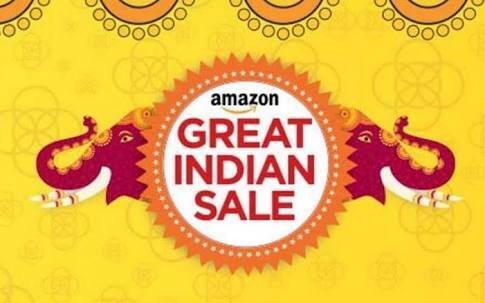 Amazon Great Indian Sale is back with more Discount!! That time of the year is back when you can shop at jaw-dropping prices from major online shopping websites. Yes, the month of October is approaching and the e-commerce industry is all ready to amuse you with their mind-blowing deals, discounts, coupons and offers on whatever you want to purchase this Diwali. Sale will be Live at 12:00 from 09th Aug to 12th AUg 2017. Keep visiting this post as we will update loot deals here in this post only. How to shop from Amazon Great Indian sale ? 1) Moto G Turbo (Black, 16GB) (4G) at Rs 9999+ 10% Cashback on HDFC Bank cards on Amazon.in webite. 2) Samsung Galaxy J2 6 2016 Gold 8GBat Rs 9,750 + 10% Cashback on HDFC Bank cards on Amazon.in webite. 3) Moto G Plus, 4th Gen (Black, 32 GB) at Rs 13499 + 10% Cashback on HDFC Bank cards on Amazon.in webite. 4) Lenovo K3 Note at Rs 9,390 + 10% Cashback on HDFC Bank cards on Amazon.in webite. 4. Offer Also Valid on EasyEMI purchases. 5. Offer is valid only on transactions of Rs6000 & Above. 7. Offer Not valid on Corporate & Commercial Cards.